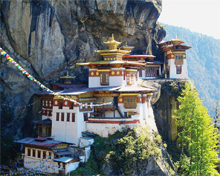 A mountainous state located on the foothills of eastern Himalayas at the extreme north-eastern corner of India, Arunachal shares international borders with China and the Kingdom of Bhutan to its north and west respectively. However, the People's Republic of China has claimed sovereignty over Arunachal (83,743 sq. km) calling it as South Tibet as the people share cultural and religious affinities with Tibetans. It is a landlocked state consisting of 26 tribes and their sub-sects with Myanmar and the state of Nagaland to the south and southeast, and the state of Assam to the south and southwest. 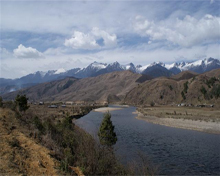 The Arunachal's terrain is full of deep valleys alternating with highland plateaus and ridges that rise in the north adjacent to the peaks of the Himalayan range. It can be seen that three broad features characterise thetopography of the region: Farthest south is a series of foothills, much like the Siwalik Range -- a narrow sub-Himalayan belt stretching across much of northern India -- that ascend from the Assam plains to elevations of 1,000-3,300 feet. These hills rise rapidly northward to the lesser Himalayas, where some ridges and spurs reach 10,000 feet. 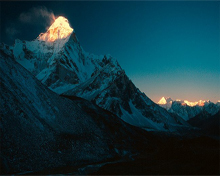 Farther north, along the Tibetan border, lie the main ranges of the Great Himalayas, where Kangto, the highest peak in the state, dominates the landscape at more than 23,000 feet. The powerful Brahmaputra and its main tributaries -- the Dibang (Sikang), Lohit, Subansiri, Kameng, and Tirap -- have a great impact on the lives of Arunachal tribes. Known as Tsangpo in Tibet and Dihang or Siang in Arunachal, the river Brahmaputra has its origins in Mansarovar lake in Tibet and flows eastward before turning south through the Himalayas into north-central Arunachal Pradesh. Finally, the mighty river cuts into a steep gorge in a mountainous terrain after winding its way southward across thelength of Arunachal Pradesh. 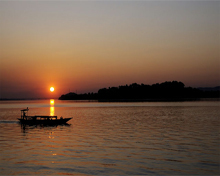 The Brahmaputra flows into the northern edge of the Assam plains, a finger of which extends into south-eastern Arunachal Pradesh near the town of Pasighat. Moreover, the Dibang and Lohit rivers join Brahmaputra at a point few miles beyond Pasighat, just south of the Assam-Arunachal border. To the west of the Brahmaputra, the Subansiri is the only tributary to cross the main Himalayan ranges. The Kameng and other rivers in the area rise up to the southernflanks of the mountains. While the Tirap river drains the south-eastern part of the state. 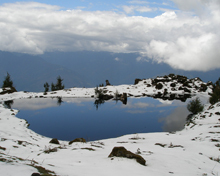 Extreme climate is experienced in Arunachal as its topographychanges due to variations in elevation. The foothill zone is sub-tropical and has a hot and humid climate just like in the mainland. In the lower valleys, summer temperatures from June to Augustusually rise to touch mid-30s degree celsius, while winter high temperatures from December to February reach an average 13 degree celsius. The mean temperatures decrease as elevations increase in the mountains. The annual rainfall in the state averages about 130 inches (330 cm) and occurs mostly between April and September. However, towards the central areas of Arunachal, the rainfall figure rises up to 160 inches (410 cm). Having nearly two-thirds of its total areas under forest, Arunachal is the most forested state in the country with diverse terrain, wild climate and exotic species of flora and fauna. Arunachal has large areas of swampy rainforest lying along the foothills. Forests of tropical evergreens and subtropical pines are found in lower elevations. With increasing altitude, the woodlands give way to mixed and coniferous temperate forests. Moreover, sub-alpine and alpine vegetation with rhododendronsappears on the higher slopes. A variety of medicinal plants including ginseng and yew grow in Arunachal. The tribes use these medicinal herbs for treatment and cure of multiple ailments. The endangered species tigers, snow leopards, elephants, wild buffaloes, serow and goral goats and deer varieties are found scattered across the forests of Arunachal.The primates such as hoolock gibbons, slow lorises, macaques and capped languor are spread throughout Arunachal offering much entertainment to the visitors and the public alike. At the high altitudes near the Himalayas, one can see very rare animals like bharals (wild sheep), black bears and red pandas. The almost extinct musk deer and takin (Budorcas taxicolor) are found only in Arunachal. Moreover, the state has an abundance of fish, varieties of snakes and hundreds of bird species from far and wide.